I thought it was time for me to remind everyone where I teach, how to register and what to expect. Currently I teach in two studios: California Yoga Center and Avenidas Senior Center. I work privately with individuals or small groups in the home and am also available to teach introductory classes and workshops at your school or office. 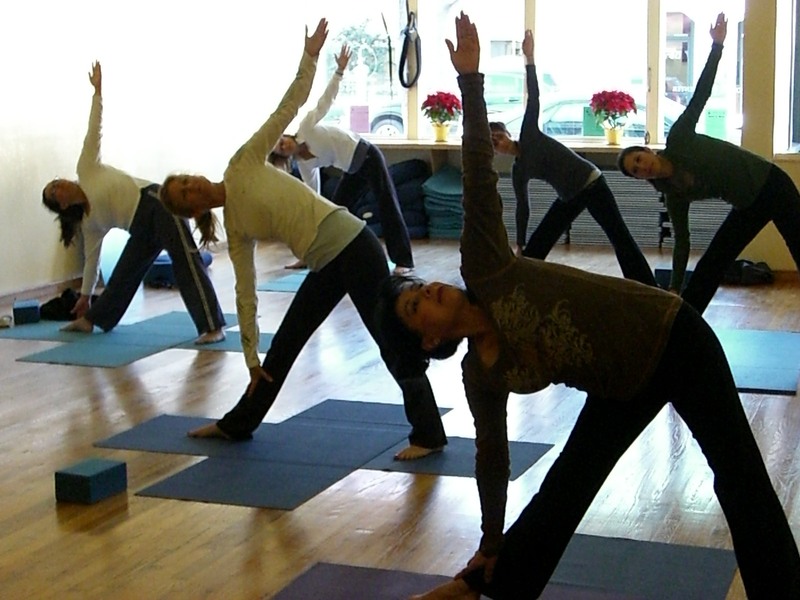 One of the first yoga studios on the Peninsula – and where so many of us were first introduced to yoga – CYC has locations in Palo Alto and Mountain View. My classes are at 541 Cowper Street in Palo Alto between University Avenue and Hamilton. I teach three classes at CYC. They are on going. Two are Iyengar-influenced “slow flow” style classes and the third is a Yin class taught in the Paul Grilley tradition. If you’re still looking for a last minute gift you can purchase Gift Certificates for individual or a series of classes. More information about purchasing gift certificates can be found on the CYC website. Yin is a donation-based class. Please pay what you can afford up to $17 (the regular drop-in fee). I keep the studio very dark. Soft futons and bolsters, blankets and pillows are used for support. Sometimes I’ll use music to help set a tone. Verbal instruction is kept to a minimum. Nevertheless, enough suggestions and options are offered to create an environment that feels comfortable and safe. All the work takes place on the floor and poses are held between 2 and 6 minutes. For more information regarding Yin Yoga look here. The drop-in fee for these classes is $15. A 4-week series is available for $52. An 8-week series is available for $104. Classes do not have to be taken consecutively and there is no expiration date (this applies to my classes only. Other CYC instructors may have different policies). In the beginning, there was Iyengar. At least for me. I loved the attention to alignment, the emphasis on safety and the slow, careful pace as we moved from one pose to another. But things change. I still love my Iyengar roots, but I also love moving with my breath from one shape to another. We move at a pace that allows time to settle into the pose and to explore how it feels in the body. I provide options for anyone not ready to take on the more challenging standing poses. Both of these classes are Level I/II – suitable for beginning and intermediate students. California Yoga Center has everything you need for a safe practice: bolsters, straps, pillows, and blocks. It’s recommended that you bring your own “sticky” mat. It’s a misnomer to call Avenidas a “senior” center. Yes, you have to be over the age of fifty to enroll in classes – but what’s a number? Pre-registration is required, but you can enroll online or drop by the front desk at 450 Bryant Street (cross street University Avenue). Classes are held in 10-week blocks. Our winter session begins the week of January 9th, 2012. There is no drop-in but anyone is welcome to visit and try out my yoga classes before enrolling. The price for a ten-week session is $60 for Avenidas members and $70 for non-members. Where are you going to find a one-hour class for $6.00 anywhere on the Peninsula? Because of student demographics these classes tend to lean toward the introductory level but everyone is encouraged to deepen into the work as their bodies allow. Some students have had years of yoga experience and will have a more full expression of the pose we’re working in. Others who are new to yoga are given modifications that help awaken the body. All three classes begin with floor warm-ups, followed by a carefully planned standing sequence and then finishing with seated work and relaxation. Because of the nature of my classes at Avenidas, it’s suggested that students be able to safely lower and then rise from the floor. That being said, chairs are available to assist. Unfortunately, equipment is limited at Avenidas. We have soft exercise mats but I recommend you bring a sticky mat and two bath towels that can be folded into mini-bolsters. A strap is also handy – this can be a yoga strap or, if you’re on a budget, a man’s tie or belt. Yoga blocks are helpful, too. If you are recovering from illness or injury then I recommend two or three sessions of individual study. Together we can see where you’re at in terms of strength and flexibility. We can build a program that will support recovery instead of setting it back. Some clients, of course, simply enjoy how individualized attention deepens their practice. You’ll discover the body responds to the work easily when hands on adjustments and personalized modifications are part of the program. This entry was posted in Diet and Exercise, Paul Grilley, Women's Health, Yin Yoga, Yoga, yoga studios and tagged Avenidas, California Yoga Center, Iyengar, Paul Grilley, postaweek2011, Yin Yoga, yoga, yoga practice. Bookmark the permalink.